This quote has stuck with me and challenged the way I spend my days. Because here’s the truth. I’m afraid of what my kids are going to remember most about me. I’m afraid that instead of remembering a mother who adored them, my kids are going to remember a mother who always had her iPhone in her hand. A mother who dropped whatever she was doing (not to come look at a picture or lego tower) but to check her text messages or emails. A mother who lived distracted instead of in the moment. I don’t want to be remembered like that. And twenty years from now, when I’m looking back on these days as a stay-at-home mom, I don’t want to regret the moments I missed. As I look at my boys (now five and two) and realize they will both be in school full-time in just a few short years, I’m beginning to understand what everyone meant when they said time would go by fast. My five-year-old, who used to cry when I dropped him off at nursery at church, is now running joyfully into his preschool class (and sometimes not even looking back to wave goodbye). These days can be long, absolutely, but the years go by so fast. These moments that are sometimes hard, sometimes exhausting, sometimes frustrating, are also the moments that make up our lives. And I don’t want to miss them anymore. I no longer want to be the mom . . .
with her mind on everything but her children. Instead, I want to be the mom . . .
who focuses on her children more than on her to-do list. If I have to miss something, I don’t want it to be the moments. I don’t want it to be my kids. Distracted living has taken too many moments already. Not anymore. Let’s talk: Have you ever struggled with distracted living? 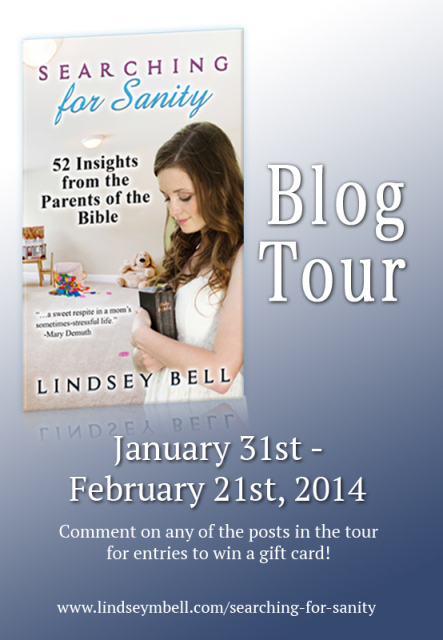 Leave a comment to be entered to win a gift card from Lindsey for her blog tour contest! This post is part of a Lindsey’s blog tour for Searching for Sanity, her new parenting devotional. You can read other posts in this tour by going to her blog. To kick off her book launch, Lindsey is giving away one copy of Searching for Sanity to one of you! Use the Rafflecopter form to enter to win! About Searching for Sanity: Have you ever looked at your beloved children and wondered, what in the world am I doing? Why did God trust me—of all people—to raise them? Motherhood is the most difficult job many of us will ever take. Searching for Sanity offers moms an opportunity to take a breath, dig into the Word, and learn from parents of the past. In short devotions designed for busy moms, this book uses the parents of the Bible—both the good and the bad—to inspire today’s mothers. I look for ways to improve the image of Jesus for my family every day and this touched me deeply. I need to be the one willing to let go of the emails, facebook moments and texts and calls. The power of messaging is that it is not urgent and I want to take this concept and see that in 10 years from now when my son is married and beginning his family that he raises up and calls me blessed. I want his life to reflect it even without words. You are going to be one I follow to help me accomplish this. Thank you so much! Thanks so much, Stefani. You are so right. Messaging is not urgent…but at times, it’s hard to remember that. I think it’s something we have to daily fight off…the temptation to view online activity as urgent. Have a blessed weekend with your kiddos! Thank you SO much for having me on your blog, Tricia. It is a true honor to be here! Yes, I have struggled with distracted living. I have tried, over the last few years, to simplify my living so that I am less and less distracted. I try to focus on my children and let other things in my life be an extension of that focus, but there is still distraction from that. Of course, I put God first in all things. One thing I’ve always believed in is making memorable moments — yet there are always going to be days that are not absolutely memorable. I’m always thinking, with my children, what if our last conversation is the last one they remember? I struggle with that, especially now that my daughter is in boarding school (only 1 hour away from me). This is definitely a challenge! So sorry to anyone who is having trouble ordering Searching for Sanity on Amazon. We have run into a problem with the site and are doing our best to fix it. If you were planning to order but weren’t able to, please send me an email at lindsey (dot) m (dot) bell (at) hotmail.com. I will send you an email letting you know when it is available as well as a 3 FREE bonus parenting videos and a FREE printable Bible verse for your home. You can view the printable at http://lindsey-bell.com/2014/01/31/searching-for-sanity-launch/. Have I ever struggled with distracted living? Everyday! Its an unfortunate story but it is true…I always have something in my way that is preventing me from spending real time with my kids that will matter tomorrow and years from now. I pray and cry weekly asking God for the help I need to be the mother He expects of me. Katrina, I hear you on that. It seems like it’s a daily struggle for me too. I wake up with a great attitude and great intentions, but then something always seems to come up. So hard! I definitely have been living distracted by my to-do list the last few months and have now seen how I have missed such precious, valuable tine with my daughter. I was just thibking yesterday how i also don’t want to be the mom with my phone in my hand, telling Zoe constantly “not now” or “later”. These first five years are critical in her development and I need to be present. I stay at home but definitely feel like there are many days I haven’t spent much time with my children. I don’t want to have any regrets when they’re grown. Thank you for sharing your wisdom and thoughts! Alli, I can relate so much to this. I stay at home with my boys too, but there are some days that I go to bed at night and think, I didn’t really play with them at all. A good reminder for us all, I think. I did not grow up in a christian home and am always interested in Christian books that will help me do better. Would love to read this book! Great reminder to live in the moment with our children. So hard to put down our phones in today’s technological world! Euro has forex brokers been selling off normally pushed the Dollar up in general.